Venus Williams wins a third-set tiebreaker to beat Petra Kvitova and earn a semifinal against Sloane Stephens. 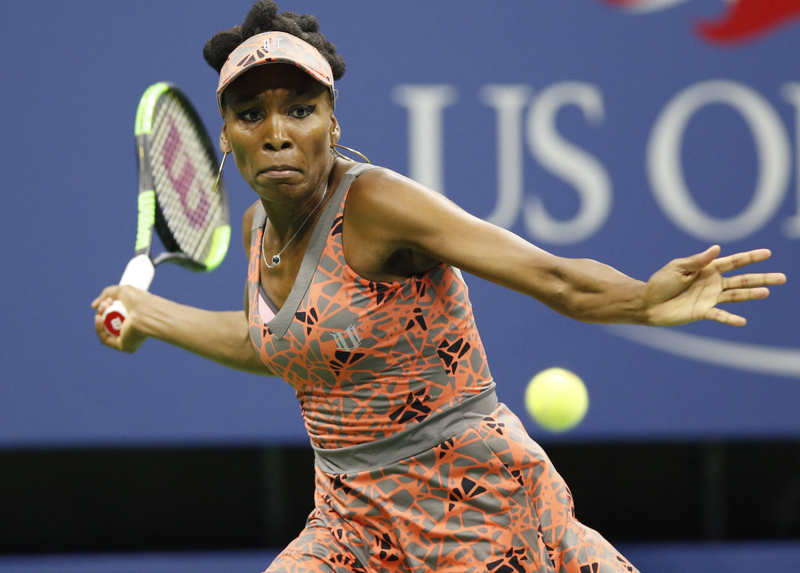 NEW YORK — Venus Williams continued her remarkable renaissance Tuesday night by returning to the U.S. Open semifinals for the first time since 2010. Williams reached her third major semifinal of the season – something she last did 15 years ago – by edging two-time Wimbledon champion Petra Kvitova, 6-3, 3-6, 7-6 (2) at Arthur Ashe Stadium. Williams, 37, who won titles at Flushing Meadows in 2000 and 2001, trailed 3-1 in the third set before digging out of the hole with a little help: Kvitova’s eighth double-fault handed over the break that made it 3-3. Kvitova’s ninth double-fault gave Williams her initial match point in the tiebreaker. Kvitova, seeded 13th, was hoping to prolong her comeback from a knife attack less than nine months ago by reaching the first U.S. Open semifinal of her career. She needed surgery on her racket-holding hand after being cut by an intruder at her home in the Czech Republic in December. She returned at the French Open in May, losing in the second round there and at Wimbledon. Kvitova has said she still doesn’t have full strength in her left hand but was often at her powerful best against the No. 9 Williams, especially in the last two sets, repeatedly delivering big, flat forehands. Neither woman played with a ton of subtlety, mainly trading stinging groundstrokes from the baseline on exchanges that grew in intensity as the 2-hour, 34-minute encounter went on. Williams, who revealed in 2011 she had been diagnosed with an energy-sapping autoimmune disease, is the oldest women’s semifinalist at any Grand Slam tournament since Martina Navratilova at Wimbledon in 1994. But this sort of throwback run is becoming routine for Williams, who made it to the Australian Open final in January, then the Wimbledon final in July. She will face unseeded Sloane Stephens on Thursday in the first all-American women’s semifinal in New York since 2002. Stephens is convinced her run to the semifinals is not proof she’s back to being as good a player as she was before foot surgery took her off the tour for nearly a year. Instead it’s a result of being better than ever. Able to summon big strokes when it mattered most, Stephens reached the final four for the first time by edging 16th-seeded Anastasija Sevastova of Latvia 6-3, 3-6, 7-6 (4) for her deepest run at any major since 2013. The 83rd-ranked American has won 13 of her past 15 matches, all on hard courts, reaching the semifinals at three consecutive tournaments for the only time in her career. She was one of the four U.S. women in the quarterfinals, the most since five made it 15 years ago. In the top half of the draw’s quarterfinals Wednesday, No. 1 Karolina Pliskova of the Czech Republic meets No. 20 CoCo Vandeweghe of the U.S., and No. 15 Madison Keys of the U.S. faces 418th-ranked qualifier Kaia Kanepi of Estonia.